My Key Pal provides double the protection from losing your keys. Keys cannot be removed without activating the release lever. 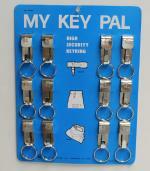 My Key Pal measures 2 1/8" long and comes with an attached 1 1/4" split ring. Packaging is 12/Card.